Briggs and stratton rebuild for the old cast iron engine. These are the engines that look almost like kohlers. 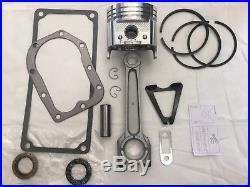 This rebuild comes with a piston and ring set , connecting rod, head gasket, base gasket and 2 crank seals. This is for briggs models 320400 thru 326499. Rod comes in choice of. (you must tell me size or std will be sent). 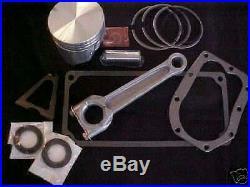 I have tried to supply the gaskets and seals for these engines and according to my info they are correct. I do not have any other parts for this engine. These are after market parts and i do not know who makes them, i just know they are getting very hard to come by. In the box and never been installed and can not be returned! And all your tractor needs. I sell a few thousand engine rebuilds a year with 100% positive feedback. Try the all-new andale gallery. Now with “smart” features. Get vendio gallery – now free!The item “For Briggs and Stratton Cast Iron 14-16 hp rebuild, NEW” is in sale since Wednesday, March 14, 2012. This item is in the category “Home & Garden\Yard, Garden & Outdoor Living\Lawnmowers\Parts & Accessories”. The seller is “bakt4kids” and is located in Wauseon, Ohio. This item can be shipped worldwide.